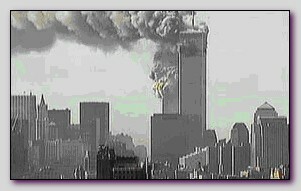 The first one, United Airlines flight11 from Boston to Los Angeles, flown by Mohamed Atta, a member of Hamburg Cell, crushed at 08:45 into the northern tower in the Trade Center in New York USA, one of the ‘Twins’. With Mohamed Atta in the team were Waleed al-Shehri, Wail al-Shehri, Abdulaziz al-Omari and Satam al-Suqami . The second airliner, United Airline flight 175 also from Boston to Los Angeles, flown by another member of the Hamburg Cell – Marwan al-Shehi crushed at 09:05 unto the southern tower of the “Twins’. In Marwan al-Shehi team were Fayez Banihammad, Mohand al-Shehri, Hamza & Ahmed al-Ghamdi. The third United Airline flight 77 from Washington to Los Angeles, flown by the Saudi Hani Hanjour , crushed into the Pentagon at 09:39. In flight 77 team took part Khalid al-Mihdhar, Majed Moqed , Nawaf al-Hazmi and his brother Salem al-Hazmi. The last flight number 93 from Newark to San Francisco, flown by another member of the Hamburg Cell – Ziad Jarrah , was late in take off – at 08:43 only two minutes before the first aircraft crushed into the ‘Twins’. When in air the passengers learned from their mobile phones about the other events. When the hijacking occurred they tried to prevent it and storm the hijackers and the pilot cockpit. As a result the aircraft crushed in an open field near Shanksville, Pennsylvania, about 240 km northwest of Washington, D.C, at 10:03. In 93 team there where only 3 muscle hijackers – Ahmed al-Haznawi , Ahmed al-Nami and Saeed al-Ghamdi . 2973 men and women lost their life in this terror attack, the most dreadful in history. The investigation revealed a very carefully planned plot with connection to Al Qaeda , Osama Bin Laden and other senior operatives of Al Qaeda . The plot was masterminded and conducted by Khalid Shaik Mohammed during 7 years. Each team of hijackers included a so called “pilot” and 4 muscle hijackers. Because only 19 took part in the hijackings a question was raised who and if there was a 20’s hijacker. From the hijackers 1 was a Lebanese, 7 were Egyptians and the rest 11 were Saudis. All the participants in The 9/11 plot spent time in Afghanistan somewhere between 1999 and 2000. All participant terrorists were selected personally by Khalid Shaik Mohammed and Osama Bin Laden . The 9/11 hijackers and their group members tried to cover up their travels to Afghanistan by different methods. By claiming that their passports were lost and asking for a new one. By traveling to Afghanistan through Iran so their passports will not be stamped. All the operatives of 9/11 were instructed to behave in a “western manner” and to shave their beards. About half of the so called “Mujahdin” came to USA, and the first time to the west, about 6 months before The 9/11 already convinced and obliged to the mission. They got their hatred to the western society and especially USA, probably, in the Arab world through radical Muslim preachers. The 9/11 Intelligence deficiency – Almost all the terrorist and most of their activity were known to at least one of the security agencies in the Western and Muslim world but the plan of The 9/11 was beyond any imagination and all the agencies failed to understand the threat and to share information.